Every now and then, JAS is fortunate to have some wonderful volunteers from all walks of life. Catherine Gillespie is one of such volunteers. Catherine is a student at the MIT Sloan School of Management, where she is working on her MBA. Catherine is a phenomenal young woman who has been committed to her community through volunteerism most of her life. Catherine has a passion for urban communities and wanted graduate school to be about more than just studying. 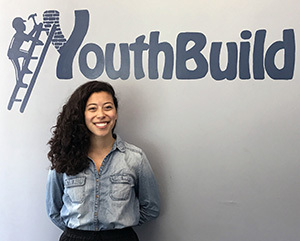 She learned about JAS YouthBuild through the MIT’s Priscilla King Gray Public Service Center and picked JAS because it was one of very few opportunities that allowed her to work in the Cambridge community and not on campus. Catherine started with JAS in February 2016 and will volunteer until late May 2017 when she graduates. She tutors math and English twice a week and is excited that some students she has been working with for 2 years will be graduating this year. Volunteers like Catherine embody the JAS spirit of helping to create opportunity, strengthen the community, and improve lives. JAS is grateful for her service and wish her the best of luck in her future endeavors.